I understand why this brush kit exists, but it's not for me. It strikes me as something that's probably better for people who wear a lot of makeup and who are pretty skilled in makeup application because each brush is so specialized, it can't really do double-duty. For me, the $98 isn't worth it for brushes that I'll seldom use. Of the eight brushes, there are only two that I use regularly, and so...read moreme of the brushes quite frankly felt superfluous (two lip brushes. but not a straightforward shadow brush?!). 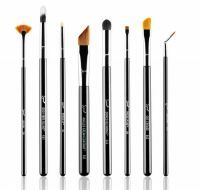 Love this brush set - makes me feel like a MUA! This set is AMAZING! So many tools to enhance every crevice of your face. I love the eyeshadow brushes, the angled liquid liner brush (a dream for my love of the cat-eye) -- there's even a brush especially for flicking off any fallout (which I always have with my super glittery eyeshadow) and not messing up the rest of your makeup. I feel like a MUA with this set!